Providing you the best range of navaratan casting made ring, chauki navratan ad om ring golden polished with hand setting stones, designer unisex party wear synthetic navratan ring, navratna small flower ring for womens, party wear synthetic navratan ring and designer unisex party wear synthetic navratan or navgrah brass ring with effective & timely delivery. You beget the good results of the all nine planets. 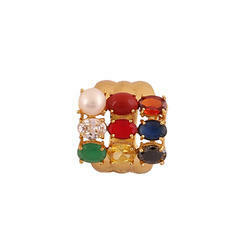 There is no need to wear any other gem stone ever after wearing this ring. A person having any retrograde or debilitated planet should wear this ring surely. Wearing this ring brings peace and prosperity in the life of the native. Ring is Golden Rhodhium Polished. Stones are hand setted (setting). Good for both men and women. Backed by rich industry experiences; we are highly engaged in offering a premium quality range of Chauki Navratan Ad Om Ring Golden Polished With Hand Setting Stones. This beautiful rhodium polished represents a small table which is also known as chauki. 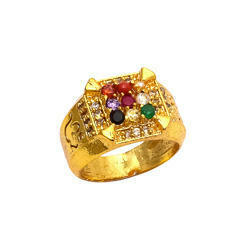 This ring is square in shape and has 9 gems or Navratan embedded in the center. The dimensions of the ring are 2×2×3 cm. Navratna are considered auspicious and are believed to be of importance in many religions. These navratnas are in groups of 3 and are surrounded by rows of Zircon on each side. At each corner of square, there is a little triangle which shows the legs of a chauki. On each side of the ring, there is a symbol of Om carved delicately. The ring weighs 100 grams, is big in size and very comfortable to wear. This ring attracts the attention of the crowd. This style of jewelry very popular today. Chauki Navratan Ring. Navratnas represent planets in Indian mythology. They are believed to bring good health of the one who wears it. They are a symbol of success, happiness, good health and peace. This is a beautiful yellow rhodium polished ring. It’s most unique feature is the shape as a small table. Therefore, this ring is square in shape. Navratan embedded in the center. The dimensions of the ring are 2×2×3mm. Navratna is auspicious and of importance in many religions. Navratnas represent planets in Indian mythology. They bring good health of the one who wears it. Moreover, they are a symbol of succes, happiness, good health and peace. Meanwhile, these gems are in a group of 3. Then there are rows of diamond on each side. At each corner of square, there is a little triangle which shows the legs of a chauki. Furthermore, on the bands of the ring, Om is carved delicately in it. The ring weighs 100 grams. Moreover, it gives a very novel look when worn. In fact, This style of jewelry very popular today. The ‘Navratnam’ is an amalgam of the nine most precious gemstones, renowned for their powers of spiritual healing. The mystical tradition of wearing the nine gems, linked to the nine planets is said to bring about great positive changes in all aspects of life. Although the origins of Navratnam cannot be traced back in written history, many cultures accept the sacred practice and even the modern believers of scientific gemstone therapy have taken note of it with approval. Navaratan Small Flower Ring is well crafted design and have magical power to strength your body and mind. Metal -Brass, Stone- Navratan, Polish- Rhodium . This Piece of jewellery comes with Parure assurance of Quality and Durability. Each Crystal is 100% hand set by skilled craftsmen. Packed In Palstic Box. Perfect for Gifting Purpose. Wear them with any of your dazzling outfit for the perfect stunning look. Made from premium quality material. This Earing assures to remain in their original beauty even after years of usage. Avoid spraying perfume or deodorant over jewellery. Avoid direct contact from water and other chemicals. It is important to store handmade jewellery carefully as each piece is unique. Hessonite (gomeda) or Rahu (the ascending lunar node). Party Wear Synthetic Navratan Ring have many zircon studded on the back of the kachua, ring is golden in color and is unisex.When the demons and deities were trying to skim the sea to get the nectar, We all are aware of this fact. Lakshmi Narayan ring is the ring and is blessed with the holy hymns of Lord Vishnu. Thus it can be said that this tiny ring is an embodiment of Lord himself. The main reason of this wonderful ring is to embrace some of the energy. This ring also comes in some exquisite Zircon stones. Zircon is considered to be most effective in stones. Stone - Ruby (maanikyam) for Surya (taraneh)(Sun), Pearl (muktaaphalam) for Chandra (Moon), Emerald (marathakam) for Budha (saumya) (Mercury), Yellow sapphire (pushparajam) for Bṛhaspati (devejya) (Jupiter), Diamond (vajram) for Shukra (asurachaarya) (Venus), Blue sapphire (niilam) for Shani (Saturn), Hessonite (gomeda) or Rahu (the ascending lunar node). Product Care: Avoid spraying perfume or deodorant over jewellery. Avoid direct contact from water and other chemicals. It is important to store handmade jewellery carefully as each piece is unique. 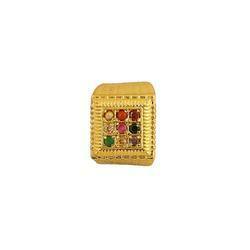 This Designer Unisex Party Wear Synthetic Navratan Or Navgrah Brass Ring with navratnas in a line. The most unique feature of this ring is its simplicity. It is a thick band made of brass. IN addition, the golden color of the ring is very durable as well. In the middle of the ring, all navratnas are laid down in a straight line. The dimensions of the stones are 2×2 mm. Furthermore, these stones are very strongly attached to the ring. It is almost impossible for them to detach. Navratna stones are astrologically considered very benificial. Also, the literal meaning of navratna is nine gems. It is easier to be connected to them and enjoy their benifits through jewellery. These gems are associated with planets and in turn zodiac signs. This ring is perfect to connect with the roots of Hinduism, Buddhism and Jainism and other historic cultures. Moreover, the classic look of the ring makes it easier to wear in any occasion. In addition to all the qualitites, this ring can also be worn everyday, according to the preferance. Some rings have the tendancy to perish over time and even get distroyed. On contrary, this ring promises durability and quality during the period of its use. Also, the website offers more variety in Navratna jewellery. Shreeshyam Gems and Jewellery Designer Unisex Party Wear Synthetic Navratan/ Navgrah Brass RingStone - Ruby (maanikyam) for Surya (taraneh)(Sun), Pearl (muktaaphalam) for Chandra (Moon), Emerald (marathakam) for Budha (saumya) (Mercury), Yellow sapphire (pushparajam) for Bṛhaspati (devejya) (Jupiter), Diamond (vajram) for Shukra (asurachaarya) (Venus), Blue sapphire (niilam) for Shani (Saturn), Hessonite (gomeda) or Rahu (the ascending lunar node), Metal -Brass, Stone- Navratan, Polish- Rhodium . This Piece of jewellery comes with Parure assurance of Quality and Durability. Each Crystal is 100% hand set by skilled craftsmen.Packed In Palstic Box. Perfect for Gifting Purpose. Wear them with any of your dazzling outfit for the perfect stunning look. Made from premium quality material. This Earing assures to remain in their original beauty even after years of usage.Product Care: Avoid spraying perfume or deodorant over jewellery. Avoid direct contact from water and other chemicals. It is important to store handmade jewellery carefully as each piece is unique. 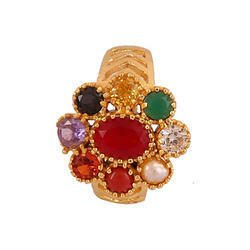 Navratan ring with a flowery touch having petals on sides and stones added in center are in flower shape. 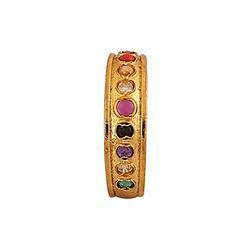 Navaratna Jewelry is getting more attention these days because of its stylish looks and astrological benefits. If wearing astrological remedies, one can wear gemstone jewelry based their zodiac or horoscope, or wear a Navaratna or Navagraha jewelry which encompasses nine stones that represent the nine planets. Navaratan Flower shape ring is well crafted design and have magical power to strength your body and mind. Navaratan Kachua Ring is well crafted design and have magical power to strength your body and mind. Wearing this locket brings peace and prosperity in the life of the native. The ‘Navratan Or Navgrah Brass Ring’ is an amalgam of the nine most precious gemstones, renowned for their powers of spiritual healing. The mystical tradition of wearing the nine gems, linked to the nine planets is said to bring about great positive changes in all aspects of life. Although the origins of Navratnam cannot be traced back in written history, many cultures accept the sacred practice and even the modern believers of scientific gemstone therapy have taken note of it with approval. Navratan Ring Chauki Design Golden Polished Fine Ring is gold plated having navratan stones scattered around in the center part of the ring, the edges are carved in shape of fence, depicting as it is protecting the ring. Nine navaratna gems in a Nava-graha pendant-yantra. The traditional setting and arrangement of these nine gems is shown in the illustration. A ruby (representing the Sun) is always in the center, surrounded (clockwise from the top) by a diamond, a natural pearl, and an emerald. This is the same placement as the Nava-graha Yantra. 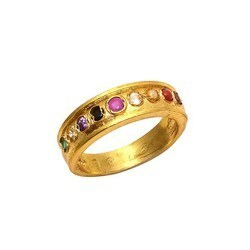 Traditionally, no gem other than a ruby or a red spinel is set in the center of a nine gems arrangement. To do so is believed to go against the flow of nature. 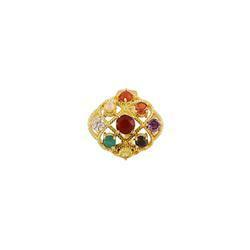 Because the Sun is the center of the solar system, its gem is positioned in the heart of a Navaratna Talisman. For an example of the navaratna in a necklace setting, see Thailand's "The Queen Sirikit Navaratna. Attractive, shiny, perfect size with proper packaging and a jewellery box for keeping it safe. Perfect gift on Mahashivratri, shivay Festival, Any Festival ,Valentine’s Day , Anniversary Day Gift, Friendship Day Gift, Birthday Gift, Merry Christmas Gift, Good gift for your friends/ lover/ family and children. It provides positive energy for doing work & removes negativity from the life of the wearer. Blue sapphire (niilam) for Shani (Saturn). Navaratan Casting Made Ring You beget the good results of the all nine planets. 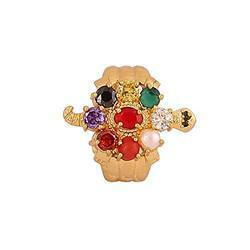 There is no need to wear any other gem stone ever after wearing this ring. A person having any retrograde or debilitated planet should wear this ring surely. Wearing this ring brings peace and prosperity in the life of the native. Stones are synthetic. Ring is Golden Rhodhium Polished. Casting made ring. Stones are hand setted (setting). Good for both men and women. Ruby (maanikyam) for Surya (taraneh) (Sun), Pearl (muktaaphalam) for Chandra (Moon), for Mangala (maaheya) (Mars), Emerald (marakatam) for Budha (saumya) (Mercury), Yellow sapphire (pushparajam) for Bṛhaspati (devejya) (Jupiter), Diamond (vajram) for Shukra (asurachaarya) (Venus), Blue sapphire (niilam) for Shani (Saturn), Hessonite (gomeda) or Rahu (the ascending lunar node) for Ketu (the descending lunar node), ...these gems must be high-born and flawless.